Ever feel bad about throwing away plastic cups? And during the summer, with all the birthdays, pool parties, BBQ and picnics-- well, that's a whole lot of cups! Since most events that we are attending this summer are pot-luck, I volunteer to bring the cups. That way, I can buy the right ones (wink!) and use them for this awesome project! Which ones are the right ones? Well, type 6 recycling plastic is the same as shrinky dinks! 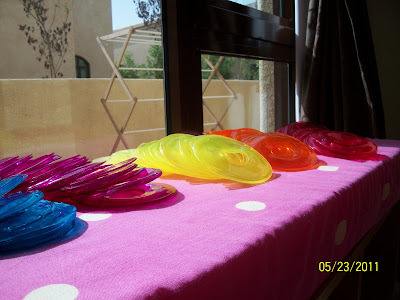 So I bought a rainbow of cups in the transparent colors (about 25 per pack). 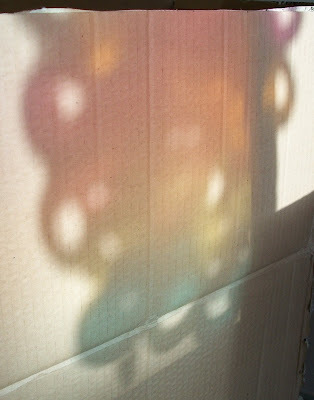 After a couple of events, and with a bag and sign for recycling the cups, I had enough to make this sun catcher! First, start with clean cups. 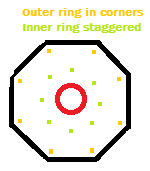 The kind I had were octagonal but had a circular base. 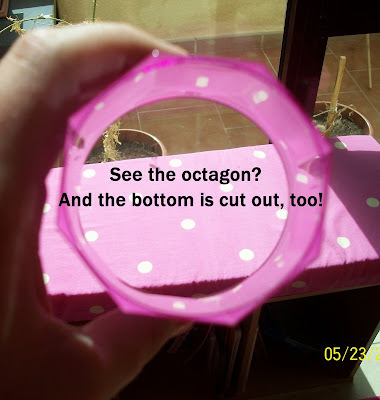 I punctured the base with pointed scissors and then cut around the circle to take the base of the cup off. 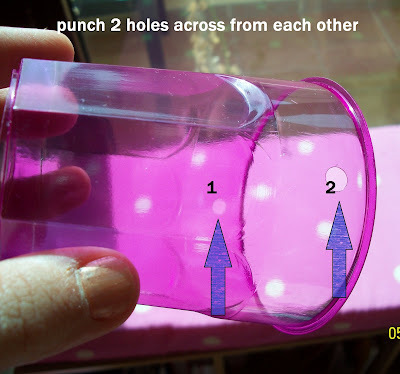 At the top of the cup, I used a hole punch to put two holes directly across from each other. These will allow you to string them together later. I used jelly roll pans and an oven at 120 degrees celsius (250 degrees farenheit.) I lined my pans with parchment paper and placed the cups TOP SIDE DOWN with the hole from cutting off the base pointing up. You don't have to space them out much-- they don't really spread as they melt. If your oven is already hot, it only takes about 2 minutes or so for the cups to melt. If they aren't completely flat, just use a spatula right after you take them out to flatten them. I have granite counter tops, so I just scooped them off the cookie sheet and let them cool on the counter. They are still a little flimsy right out of the oven, so I wouldn't use a cookie rack to cool them. Once cooled (which only takes a second), I used gold yarn to string them up with an outer circular layer and an inner one. 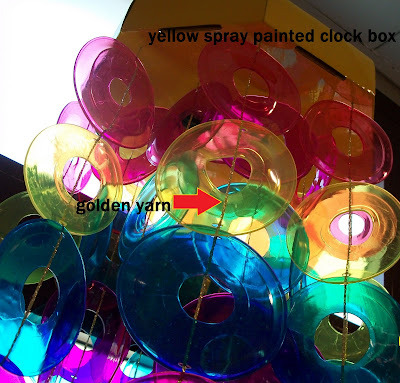 For the top of the chandelier, I used a clock box from Ikea, spray painted yellow. Since it was octagonal, I decided that it would be easiest to have 8 strings of discs for the outer ring and 8 (staggered in between the original 8) for the inner ring. . 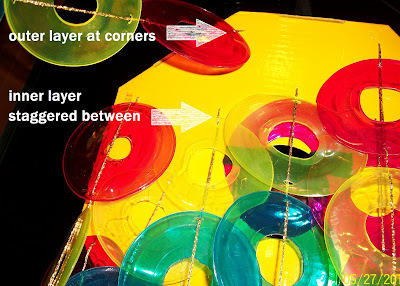 The outer ring has 5 discs (one of each color) and the inner ring has 7 discs, so that they would hang down a little more. 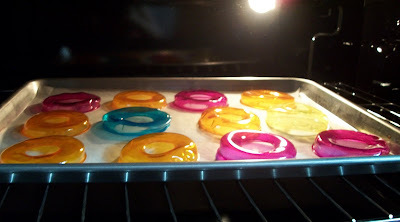 I used a different order for colors for the inner ring so that the colors would mix between the two layers. So- all total you will need 8x5=40 cups for the outer layer and 8x7=56 for the inner layer, or total 96 cups. 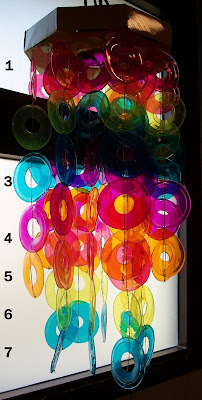 It's not evenly distributed between the 5 colors, so decide on your color scheme first to see which colors you'll need I left one end of the string of discs a little longer (tied the other end to the last disc) and then used a needle to thread it through the painted box. I tied adjoining strings together using a square knot, just to keep them from slipping out. 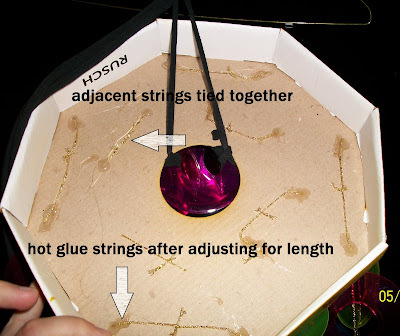 Well go back and hot glue everything in place once everything is attached to the box. 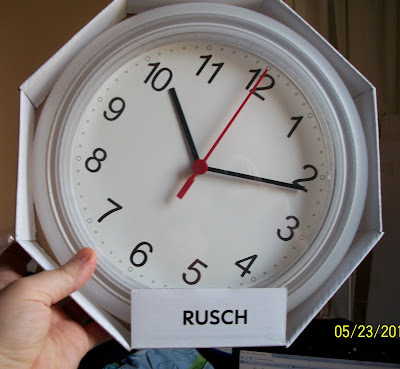 Since clock boxes have a central circle, I used an extra plastic ring with yarn tied to it (and hot-glued into place on the box) to hang the whole contraption by stringing it up through that hole. Then, hang by a window and enjoy! This is so pretty! What a great way to recycle. This would be neat as a sort of wind-catcher too, getting full sun on a porch. Thanks for sharing such a fun project. I am going to have to try this! Oh boy...my daughter is going to love making this one with me. Thanks for sharing! So pretty!!! Does the plastic give off a fume when it is melting though?? Just - WOW!! Love it! Love this idea! Where did you find your cups? I can't seem to find the right ones anywhere. That is awesome and gorgeous! 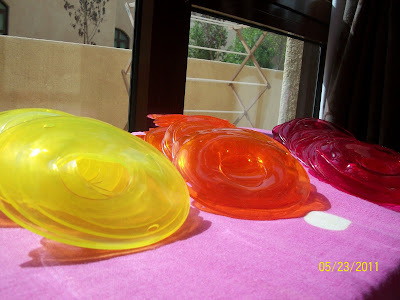 I was playing around with melting plastic yesterday - so much fun to watch it change! I just thought I would tell you that I featured you! This is so beautiful! I wish I could find the colored cups in bulk somewhere, I'm wondering if Sams Club would have them? This is fabulous! I LOVE it! Thanks so much for sharing your creativity with us! really want to make this as a lamp! j'adore !!! tout simplement WOw!!! Gorrrrgeous! Thanks for the fabulously detailed tutorial and the great, inspired idea! would you relax? geez. 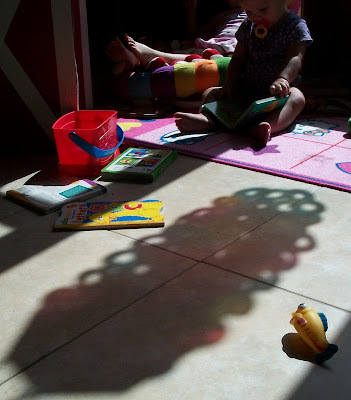 way to turn something fun and innocent, like a suncatcher, into a bummer. I found this on Pinterest!love the idea,I could see this as a lamp also! thank you for the inspiration! Wow, what a bit of work and thinking does for the indoors and out! Love the burst of colors! Thanks! this is awesome! grat idea! i will tweak it to look like sea glass and will add sea shells for a great sea-themed wind chime! you are truly talented! This is so cool! I kinda want to make door curtains for my sister's dorm!! :) so many possibilities!!! We just bought 45 acres in the country which has a home with a front and back porch. Birds LOVE the porch rails. I Don't love what the birds leave for rent payment. This will make those porchs look great and keep the birds humanly away. I love this and hope to be trying it soon. Thank you for such a wonderful idea. This is fabu! Where did you get the cups? My store has the ugly red and blue ones and they aren't transparent. Thanks for the tutorial. Hi Erin - I was wondering if you comboed plastics together before they went in the oven if they would melt together or still be separate? Also, how did you tie these off at the ends? Thank you!! 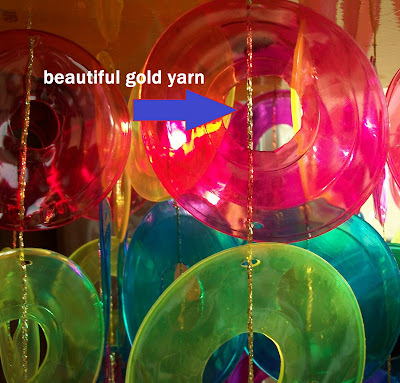 These will be great for sensory integration hanging from the ceiling of my profound classroom. I`ve already spent too much out of my pocket this year! What if we done have oven? Wat can we use to melt it?? Erin, where or where can I find cups like this. All I can find are tapered cups and those make really ugly circles. Please share your source for the cups. Pretty please! Where do I find these cups? I have never seen them in a store. This is so cool! My oldest daughter is going to church camp next week, and my younger one is staying home for "Mom Camp". This is on our list of Pinterest projects for sure! I have looked for the cups but unable to find them. Can you tell me where to find or what brand to look for? I can not find these type of cups. Where did you find them? Would other clear colored cups work? Great idea. I never could find the right cups though. 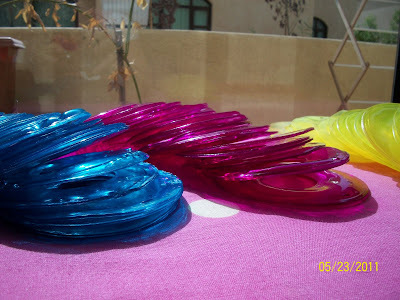 I tried it with three different types of cups and they all melted crooked and unusable. I finally quit and drilled holes in party plates I found at Hobby Lobby. Not as cheap but still pretty. Hi! I've been looking diligently everywhere for these cups. Can you tell me where you first found them? Thanks!